Walt Disney Disneyland Wall Sign Plaque Vintage Park Entrance Marquee New Follow your heart to The Happiest Place on Earth and bring home this replica sign of Disneyland's classic Main Entrance marquee. Now you can live or work under a positive sign of the times all year'round! Replica of original Main Entrance parking lot marquee at Disneyland Park Screen art print on composite wood backing Composite wood Approx. 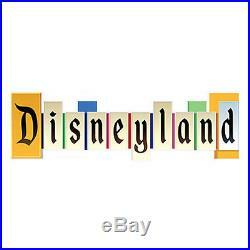 10 1/2'' H x 36'' W.
The item "Walt Disney Disneyland Wall Sign Plaque Vintage Park Entrance Marquee New" is in sale since Thursday, August 11, 2016. This item is in the category "Collectibles\Disneyana\Contemporary (1968-Now)\Theme Park Souvenirs". The seller is "theluckypennyllc" and is located in Kissimmee, Florida. This item can be shipped worldwide.